The Swiss based manufacturer Bullskate has recently appeared on my radar. They are producing a familiar format of "pegger" style bike available for sale or rent from a number of outlets in Switzerland. It will be interesting to see if their involvement at various Swiss ski resorts will open up new terrain in Switzerland. Although it is arguably the most expensive place to ski in Europe they do have a reputation for the best areas bar none. 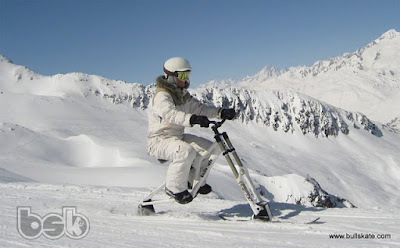 It will also be interesting to see the effect on the other ski resorts if the Swiss choose to spend more of their disposable income on skibikes and skibiking. Bullskate Snowbike - not just for girls!